ISLAMABAD (92 News) – Eminent French intellectual and Director of the premier French think-tank Institute for International and Strategic Affairs, Dr Pascal Boniface has supported France’s civil nuclear cooperation with Pakistan, on the pattern of the US-Indian civil nuclear agreement, saying that ‘Pakistan as a country of 200 million people with nuclear weapons has a pivotal role to play in the most strategic part of the world’. He made these remarks during a guest lecture on ‘France, Europe & Changing Global Scenario’ at the Pakistan-China Institute, which was chaired by Chairman Institute of Strategic Studies Ambassador Masood Khan. 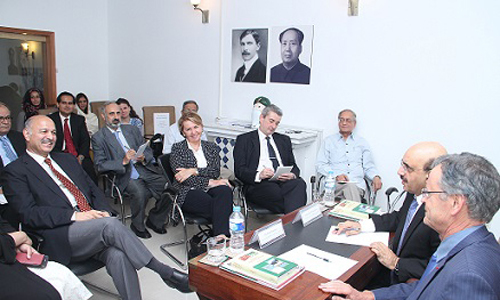 Chairman of the Senate Defense Committee and who is recently-elected as Chairman of the Parliamentary Committee of the China-Pakistan Economic Corridor (CPEC) Senator Mushahid Hussain was also present on the occasion, while the lecture was attended by the Ambassador of France, H.E. Mrs Martine Dorance, and Belgium Ambassador, H.E. Verheyden, as well as heads of think-tanks, university professors and scholars of international relations, former Foreign Secretary Riaz Khokhar and former head of ISI, Lt Gen (r) Asad Durrani. Chairman Senate Standing Committee on Defence Mushahid Hussain Syed praised the French role in world affairs, whose architect was the great French statesman, the late President General Charles de Gaulle. He said that countries like France and China, together with Pakistan, would be ‘key players in the emerging multipolar world’. Lt Gen (r) Asad Durrani said that in today’s world, ‘there are two forces with a truly global outreach, the United States and al Qaeda’, with a capability to strike anywhere militarily anywhere in the world. The participants acknowledged that France, the largest country in the EU, and with nuclear energy providing the bulk of its power needs, is leading the world in civil nuclear energy technology for peaceful purposes.